British BP, the technical operator for the development of the giant Shah Deniz gas condensate field in the Azerbaijani sector of the Caspian Sea, has switched over to the normal volume of gas export via South Caucasus gas pipeline. BP also said it gradually increases the gas export volume via the South Caucasus Pipeline, Trend Agency reported on February 10. Currently, some 18.3 million cubic meters of gas is delivered to Turkey, around 2.5 million cubic meters - to Georgia and some 5.4 million cubic meters - to Azerbaijan. "Currently, the exports are rising, and soon they will be brought to the required level," the company noted. The gas export volume was reduced as a result of the problems, which occurred at the Sangachal terminal in afternoon on February 7. The South Caucasus Pipeline (Baku-Tbilisi-Erzurum pipeline) transports gas produced from the Shah Deniz gas condensate field located in the Azerbaijani sector of the Caspian Sea. The gas is supplied to Georgia and Turkey. 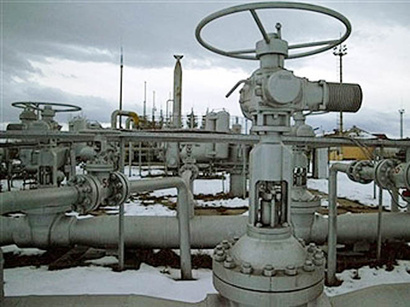 Azerbaijani State Statistics Committee reported in 2013 the South Caucasus Pipeline transported 4.7 billion cubic meters of gas, compared to four billion cubic meters in 2012. The second phase of development of the Shah Deniz field envisages expanding the South Caucasus Pipeline. The project on expansion of the pipeline in Azerbaijan includes the construction of an additional pipeline with a 48 inch of thickness. The expansion of the pipeline in Georgia will be provided through the construction of two powerful compressor stations. Currently, the real capacity of the South Caucasus Pipeline exceeds eight billion cubic meters per year. Following the expansion the pipeline will be able to transport an additional 16 billion cubic meters of gas per year.